So you can handle two plates for reps, but a single with three seems miles away. Don't waste another bench day! Follow this program, starting now. Why bench 300? Because it's a more interesting answer to the ultimate lifting question. You know the one. Because it's the difference between "Sure, I lift" and "No, serious: I LIFT." Because the bench press is the ultimate upper-body mass and strength builder, and getting stronger at it makes you bigger and stronger, period. Listen, repping with two plates is great. For plenty of people, it's enough. But when you're knocking on the door of three plates, you're officially getting somewhere. This plan will get you there. Follow each workout exactly—every rep, with the weight specified—and you very well might push your strength ceiling even higher. 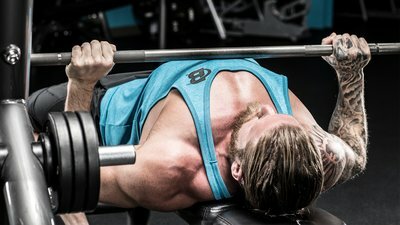 On your next chest day, try this, the first workout from Bodybuilding.com's Bench 300 program in All Access, and get ready to build a next-level bench! Am I strong enough for this plan? Bench 300 is designed for a lifter who can do at least 225 for a couple of clean sets of 5. In other words, 225 with no writhing, serious struggles, or help from a spotter. All 5 reps should be smooth and relatively easy. If you're not there yet, stick with proven strength building programs until you are. Then you'll be ready to thrive on a specialization program like this. Should I test my 1RM before or during this program? Nope! Think "reps," not "rep." As long as you can do no-doubt reps with 225 at the start of the program, you don't need to know what your true one-rep max (1RM) is. Even powerlifters rarely test their 1RM. However, if you want to know your 1RM, it's not hard to find out—and you don't need to do a brutal 1RM test to do it. Just use Bodybuilding.com's One-Rep Max calculator, and put in a weight you can handle for 3-5 non-life-endangering reps. That'll give you a surprisingly accurate estimate of your 1RM strength. If you'd like to track your 1RM on multiple lifts over time and take them with you wherever you go, you can also download our 1RM calculator app. Calculate your max safely and easily, and then track it over time, on any lift with our easy-to-use calculator! Do I really need a bench specialization program? Not everybody does. Some lifters can attain serious levels of strength by doing nothing more than 3 sets of 8-10 reps or 5 sets of 5, and bumping up the weights over time. For many, many others, that works to a point—usually somewhere between 225 and 265. At that point, they experience a strength plateau that can last months or even years. When that happens, you must specialize to a certain degree to get stronger again. Note: "Specialize" doesn't mean you'll do nothing but bench for 12 weeks—far from it! All it means is that following this program, and benching 300 pounds, will be your major goal for that period of time. Everything else is secondary, so dial it back a bit and devote your real training passion here. In your first Bench 300 workout, you'll be using weights that you can most likely handle, racking up some quality reps before things get really serious a few weeks from now. Wondering if you should only do this workout once a week? What to do with the rest of your workouts? How wide to grip the bar or what bench accessories can help you make the most of this program? Check out the Training Overview in Bench 300 before you un-rack a single bar. Also, get the in-depth instructions on the warm-up below in the Warm-up and Mobility Overview. Today, if you find yourself struggling mightily to hit the reps on any particular set, stop one short of failure and try a rest-pause. Rack the weight, rest for just 15 seconds, and hit another single. Repeat until you've hit your reps—with a spotter close by! If you can't meet the rep range with the advised weight, step down 10 or more pounds. Don't be a hero and injure yourself. No one cares how much you can dumbbell fly! If that workout makes you feel strong—and ready to feel stronger—great! That's what the first day of any program should feel like. Weeks 2 through 12 of Bench 300 are structured just like this workout: specific weights for each rep, each day. You'll alternate heavy bench days with heavy incline days, giving your body just enough variety to get brutally strong and feel great. To follow the full 12-week Bench 300 program, just sign up for Bodybuilding.com All Access!